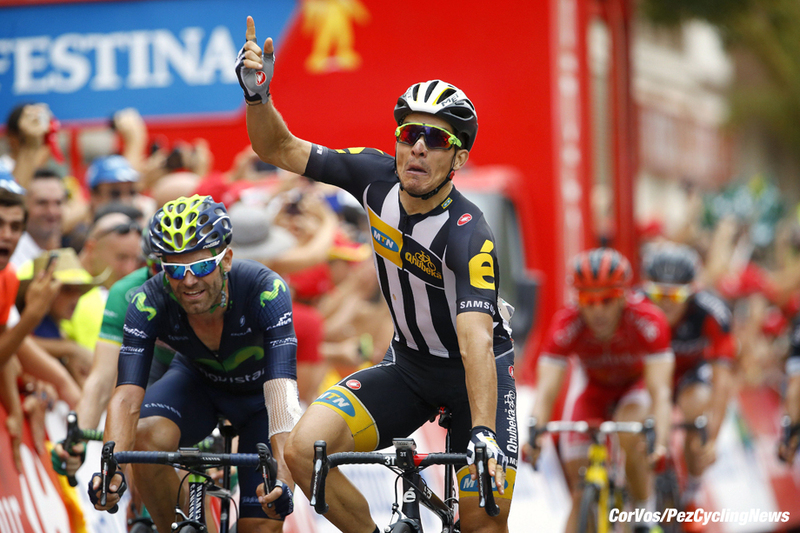 Kristian Sbaragli won MTN-Qhubeka’s first Vuelta a Espana stage by sprinting to victory in Castellon. It took a while for a break to be formed but when it did it contains 40 riders, forming on the third category climb of the Puerto del Oronet after 25km. The breakaway contained representatives from all the teams in the race, but they failed to work together and after a few sporadic attacks and a day of never being more than 1′ ahead of the peloton, they gave up and it all came back together with 55km to go. The only other obstacle on the stage was the category 2 Alto del Desierto de la Palmas, which came just before the finish and had a 10km descent before a 6km flat run in to the end of the stage. BMC’s Alessandro de Marchi was the first man to attack on the Desierto as the race hit the footslopes. His attack gave him a small gap which was crossed by Romain Sicard (Europcar). Kenny Elissonde (FDJ) and Jerome Coppel (IAM) then sprung clear to form a two man chase which caught Sicard and de Marchi. Elissonde attacked the group and soloed away to take the points at the top of the climb, before being caught by de Marchi and Sicard as the trio began the descent with an advantage of just 30″ on the peloton. Dumoulin had made his presence known at the front of the peloton on the climb and now featured at the front of the peloton as he led them down the descent until the road flattened out with 7km to go. With such a slender lead the trio were never going to be able to hold off the peloton and were duly caught shortly after the gradient eased off. As the race progressed to the final km no team was able to take control of the situation and sort ouot their leadout trains which caused havoc as they went under the km to go banner. Degenkolb was in the mix as was Tosh van der Sande for Lotto-Soudal but it was Sbaragli who was able to accelerate past Sande and Degenkolb to take the stage win. Dumoulin protected his lead in the general classification by finishing safely within the bunch as the GC remained unchanged going into the first rest day.